Callistosporium is a small genus of white-spored wood-rotters that produce fairly small, uncommon, veil-less fruitbodies. All are saprobic occuring on both conifers and hardwoods. The spores of dried fruitbodies are rumored to have reddish inclusions when mounted in KOH, but we emphasize that this is RUMORED. The fruitbodies of the species in our area, however, do produce a strong red color when dabbed with KOH. Only one species occurs in our area, but it goes by a name given to European material, so a critical comparison should be made. Identification is hinged on identifying the genus (since only one species occurs in our area). 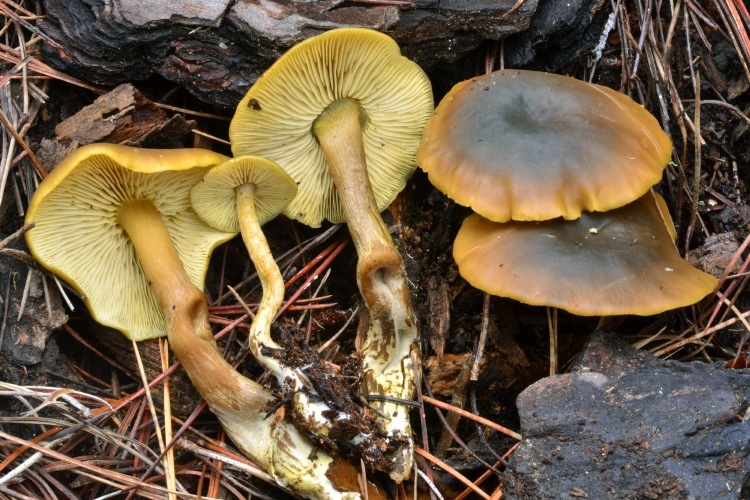 Doing so is only complicated by elimination of Tricholomopsis, but that genus produces fruitbodies with very different colors, caps with dark fibrils, and/or different KOH reactions.